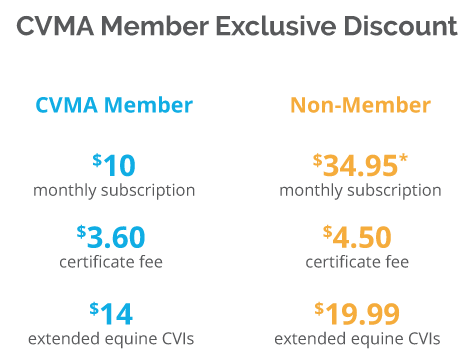 As a CVMA recommended member benefit, GVL® offers all CVMA veterinarian members an exclusive discount. GVL provides veterinarians with unique, web-based software solutions for animal movement certificates, veterinary prescriptions, EIA testing, client communications and more. Thousands of veterinarians save time with GVL, reducing errors and compliance issues, retaining client information and records in a searchable account, and providing clients with online access to their documents. With the GVL software platform, veterinarians have a comprehensive solution for digital Certificates of Veterinary Inspection (CVIs) that take the guesswork out of state movement requirements. Sign up for GVL today and receive your exclusive CVMA member discount. Complete the sign up process (have your CVMA member number handy) and a GVL team member will contact you to finish setting up your account. Note: If you need help locating your member number, contact the CVMA at 916-649-0599. Our fully staffed GVL customer success team offers continuous help, training and support that is unmatched by alternative solution providers. Have questions or want to learn more? Explore the GVL help center for informational articles, useful resources, Frequently Asked Questions and find what you need. You can also contact our customer success team.